I’ve seen this tactic before…a buyer disses the merchandise to try and get the seller to reduce the price. But there is nothing wrong with these pins or how I’ve described them and they are fairly priced. But I did offer her a 10% holiday discount. I didn’t hear back from her. Fast forward four months and she contacts me again! She upped the amount she was willing to pay for the pins by $5. I had to smile. Well, she is tenacious. But, again, I said no. She got back to me and asked if there was a discount. I gave her the same 10% off discount I had given her in December. I didn’t hear back from her. I’ve been limiting my picking this week trying to catch up on listing, but I did get to a few thrift stores. No super-duper finds, but a few bread-and-butter items. 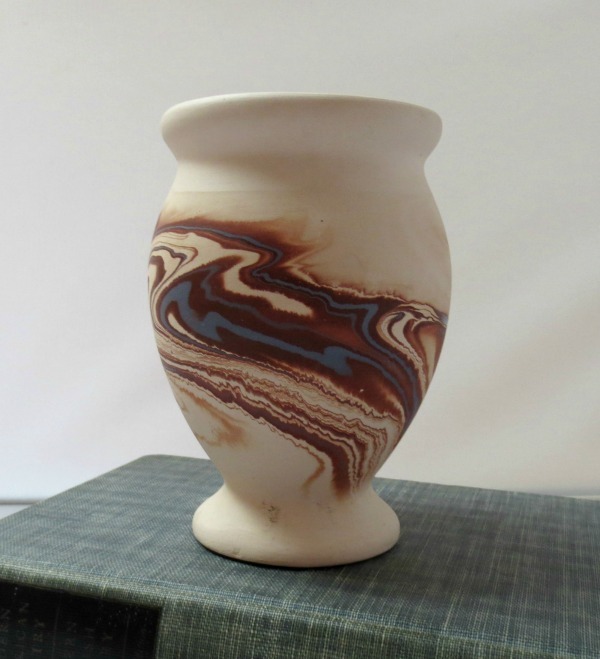 A Nemadji Pottery vase. These are not rare or expensive, but they have an interesting look and they are made in the USA. 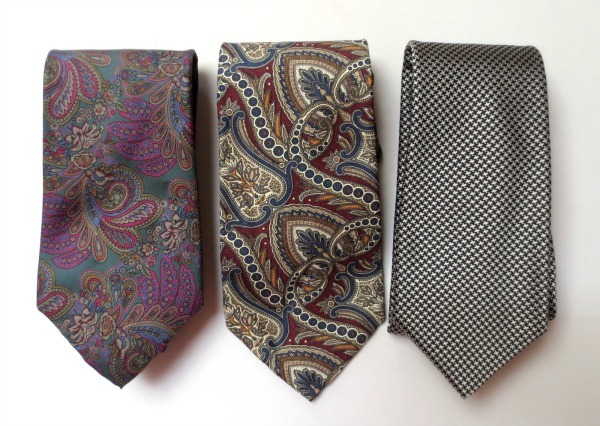 Three silk ties…one from a defunct men’s store called Widemans of Palo Alto, a Robert Talbott Nordstrom tie (I tempted to wear these myself as I love paisley!) and a Thomas Pink tie from England. I was going to stop buying ties, but I sold one recently so that got me focused on them again…particularly as they are so easy to store and ship and Father’s Day is coming up! Though, alas, in our casual society, ties are seldom worn. Oh for the Mad Men days when men wore suits, ties and hats every day! 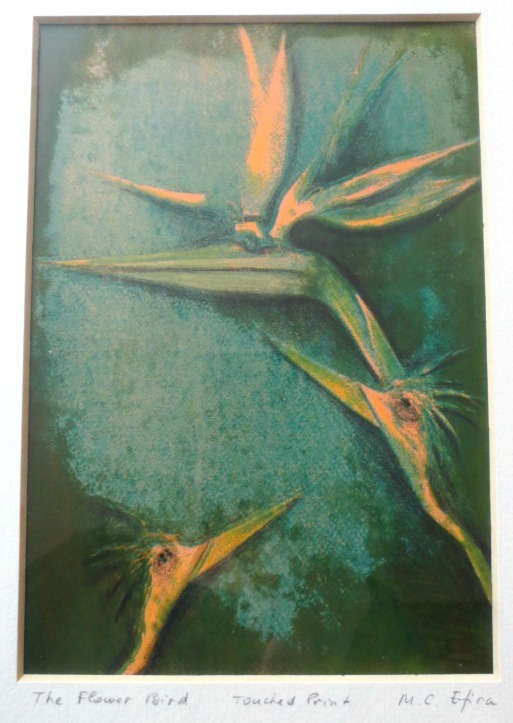 A quirky art print with bird of paradise flowers that are morphed into birds. 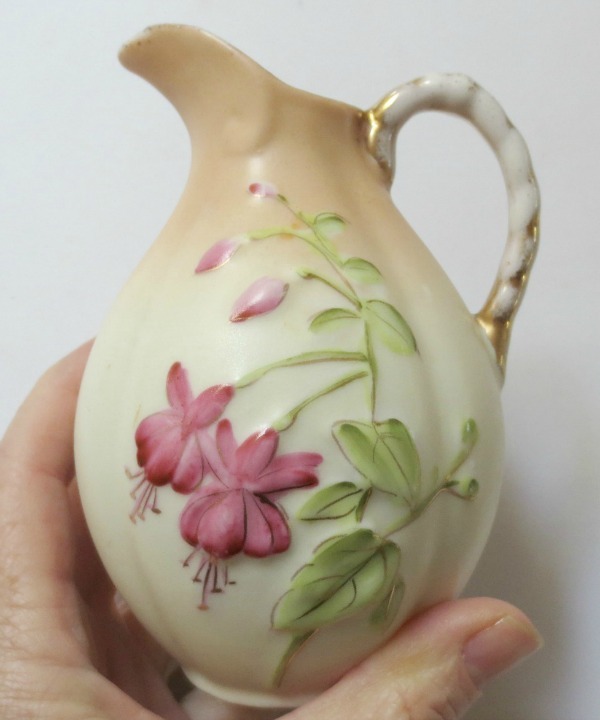 A shabby chic, hand-painted old creamer. Of a bygone era, but sweet. I can picture it on a mantel with a small handful of wildflowers in it. If you saw my last post about the rusty, cast iron glass mold, you know that I wondered if anyone else would see the beauty in it. Well, I am happy to report that several people did!! In fact after reading the post, a friend contacted me and asked if I was interested in doing a trade. I was offered a selection of items, all overwhelmingly magnanimous in my favor!! What a lovely confirmation to “my gut feeling” about it. And thanks friend…I love my choice!! but of all your items I like the old- ladyish (pejorative term alert) the best.